John O’Hara demonstrated a remarkable talent for storytelling and writing from a young age. 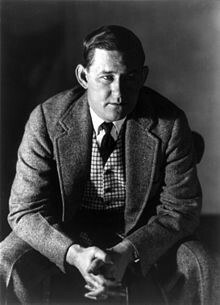 Named Class Poet and valedictorian at his secondary school in New York, O’Hara was set to attend Yale in 1924 when his father passed suddenly, leaving his family without the means to do so. This shock sharpened O’Hara’s sense of class difference and social injustice. After graduating from Niagara Prep in Lewiston, New York, he worked as a reporter and then a short story writer for magazines. Living in New York and later Princeton, O’Hara became a regular fixture of the New Yorker magazine, publishing 200 short stories through the ‘20’s and ‘30’s. He spent WWII as a combat correspondent in the Pacific Theater, and later decades writing further novels and stories. His career as a columnist continued after the war, and he was known for his politically conservative commentary, unequivocally supporting Barry Goldwater for President in the 1964 Presidential Election. He also frequently commented on Ivy League universities and academia, weighed the benefits and costs of degrees. His literary talents extended beyond short stories, as he wrote numerous critically-acclaimed novels like Appointment in Samarra and BUtterfield 8. In the postwar world, his story-writing continued as he published more novels and screenplays. In 1956 his novel Ten North Frederick won the National Book Award, while in 1962 he was spurned by the Nobel Prize in favor of fellow writer John Steinbeck. He was credited by colleagues at the New Yorker as “among the greatest short-story writers” and one who helped develop what many would call “the New Yorker short story.” His writing crossed into musicals and films. Several more books were turned into plays, musicals and/or films including, Pal Joey (1940), and From The Terrance (1958) and are among his best-known works. In addition, he wrote hundreds of short stories, articles, and papers that were often published in various national publications. Following WWII, O’Hara moved to Princeton, where he continued to write for various newspapers and magazines over the next 20 years, such as the Trenton Times-Advertiser, Collier’s Magazine, The New Yorker, Newsday, and more.